Mohanji’s grace; thousands of lights were lit for and by small children in Jammu during Diwali Festival in September 2011. 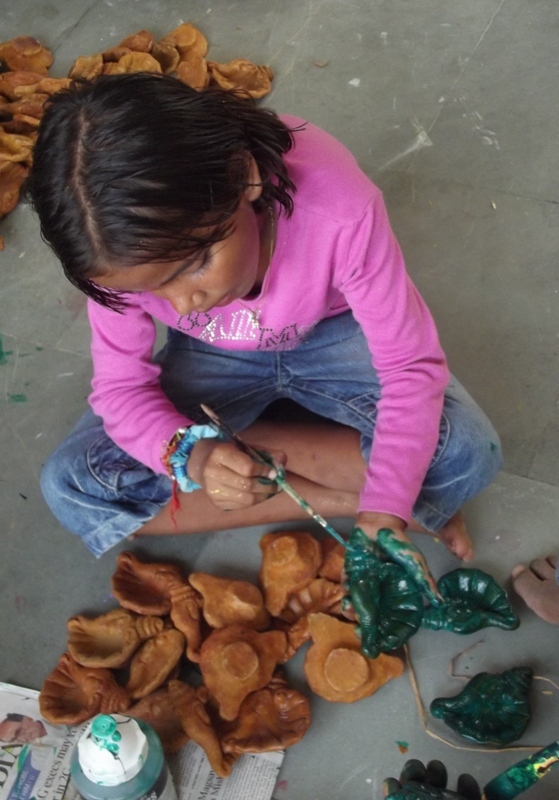 The BTW Jammu Family spontaneously thought of this activity of painting of Diyas (lamps). Almost 5500 lamps were decorated within 2-3 weeks. This activity was organized to have some smiles and joy in the lives of underprivileged children during this festival. When there is purity in thought, word and action, Mohanji’s grace flows abundantly. Helps falls from all direction. Solutions happen spontaneously. We, the BTW Jammu Family certainly experienced Mohanji’s grace. We understood the value of spontaneity, simplicity, beingness, selflessness, togetherness and flowing with the time… all that Mohanji has been telling us to do. Here is the small story of this activity. Diya activity was all Grace and BLESSING of Mohanji. He gave us the idea and he was the one responsible for its execution. We all were just following his guidance. During the regular Sunday ‘Power of Purity meditation’ this idea of diya painting took birth. Everyone welcomed the idea and voluntary came forward to participate. 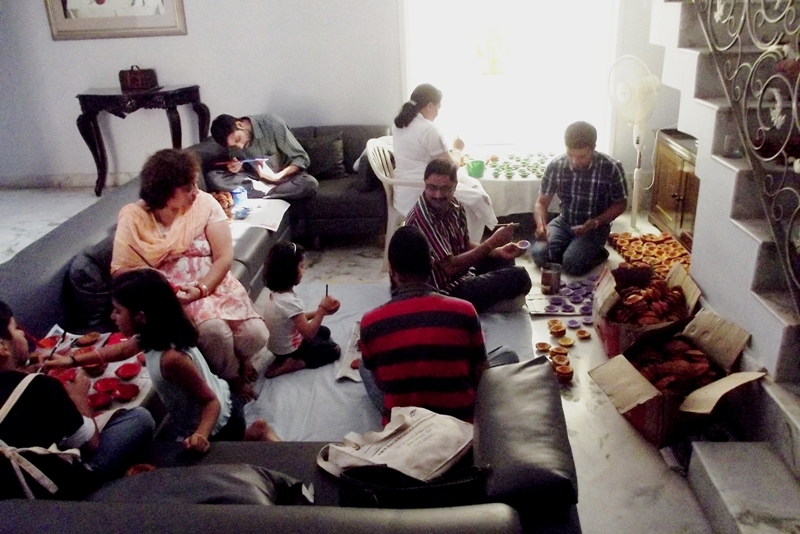 This was 2 Oct 2011 and the Diwali festival was on 26 Oct 2011. There was not much time, but still everybody said, “Yes we can do it as Mohanji is with us !!!”. Sumit, Suman Gupta and his wife Jyoti Gupta found a vendor who was selling beautiful designer diya in the outskirts of Jammu city. 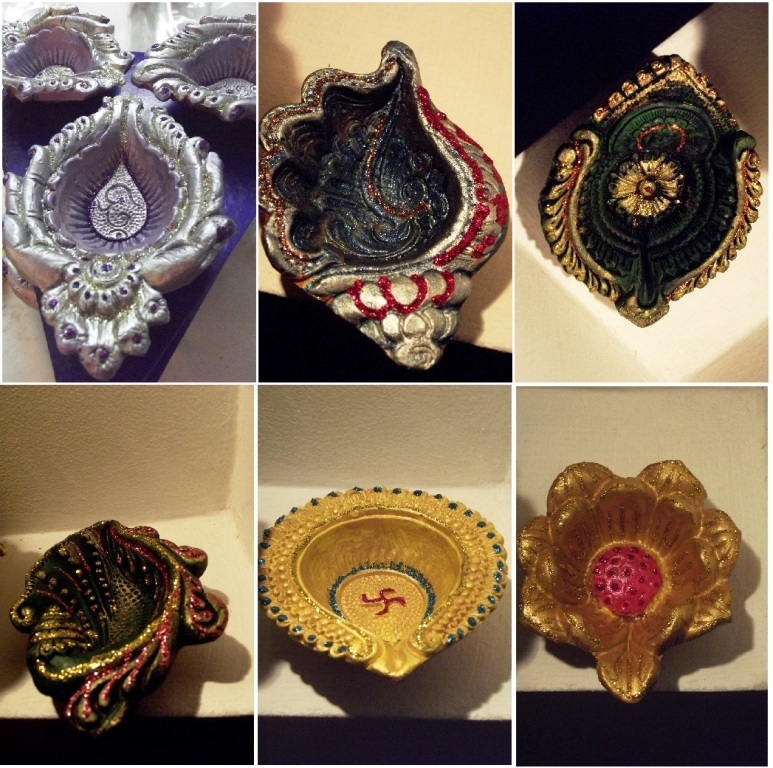 All were surprised to see such a lovely and unique diyas. This is how Mohanji works SILENTLY! Initially 4ooo diya were bought from the vendor at very reasonable cost. 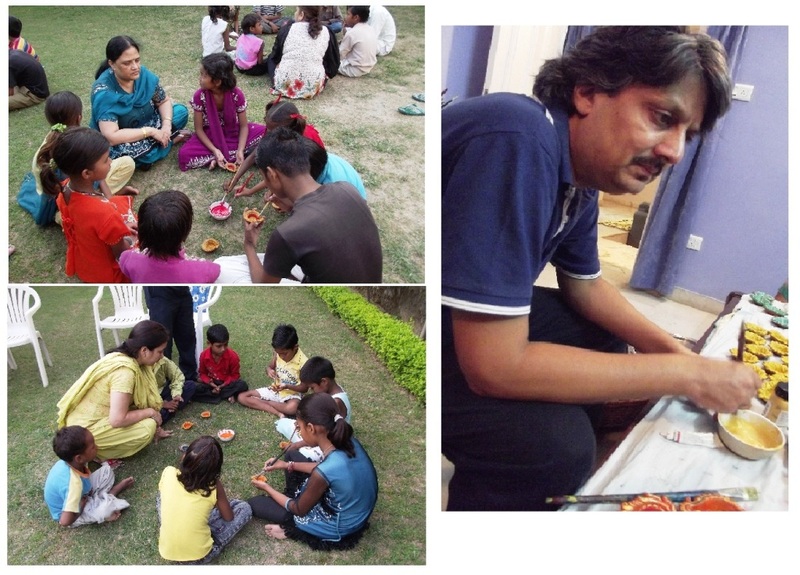 Suman Gupta and Jyoti Gupta voluntarily offered his house to conduct the painting of diyas. 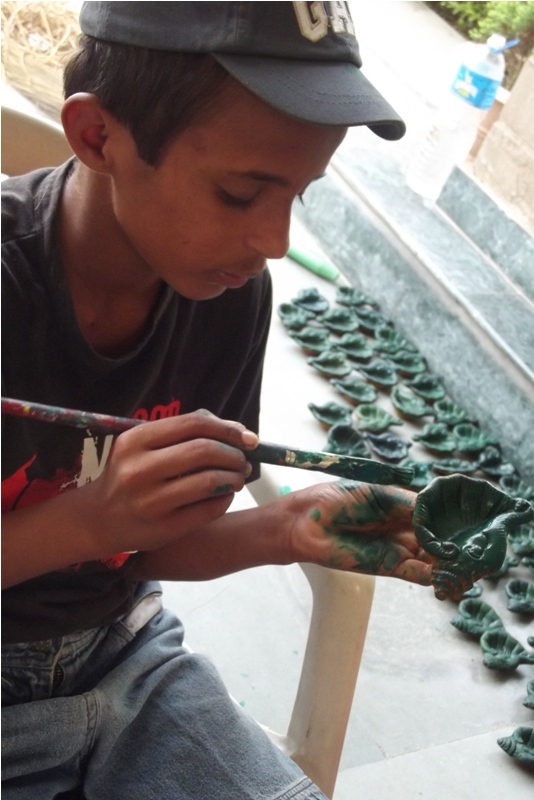 Right from painting to packing, diyas went through all stages in his house. On next Sunday meditation, work was delegated to BTW Jammu Family members interests and skills. Few members were assigned for painting and decoration and few took up packing and selling. 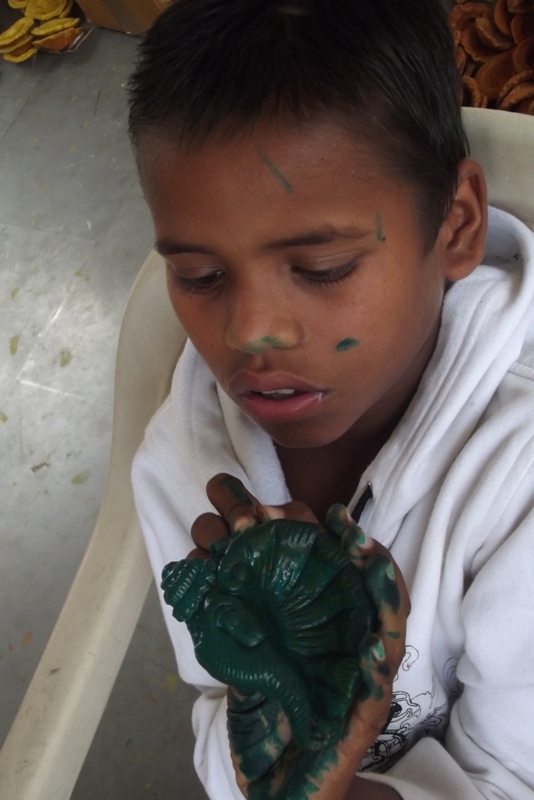 Few samples of designs of diya were finalized and were shown to the entire group on a meditation day. 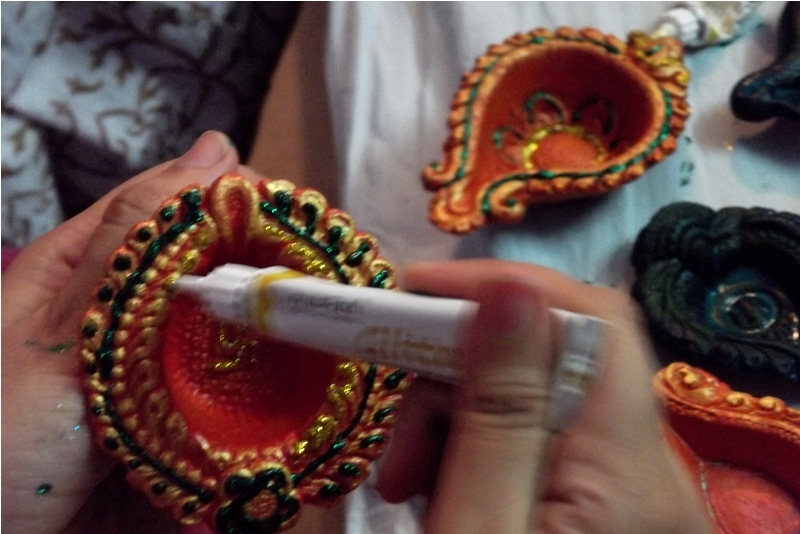 With everyone’s feedback final colour and design for various diyas were finalized. 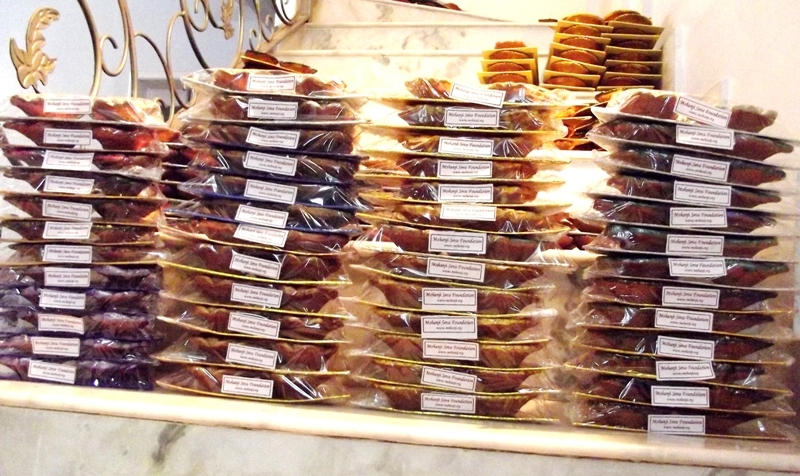 As one friend of Sumit on seeing one sample immediately placed the order of 500 packets! Mr. Suman Gupta sponsored paints while Sumit and Kamal Kishore Gupta sponsored packaging material. Narinder Rohmetra managed beautifully Hotel Fortune in Jammu as main sponsors. At every step Mohanji’s grace was felt. His presence was felt very strongly throughout the activity. Mohanji was sending volunteers to help in painting and packing . Their happiness melted our hearts. We realized why Mohanji says, “What we give is more sacred than what we ask for”. 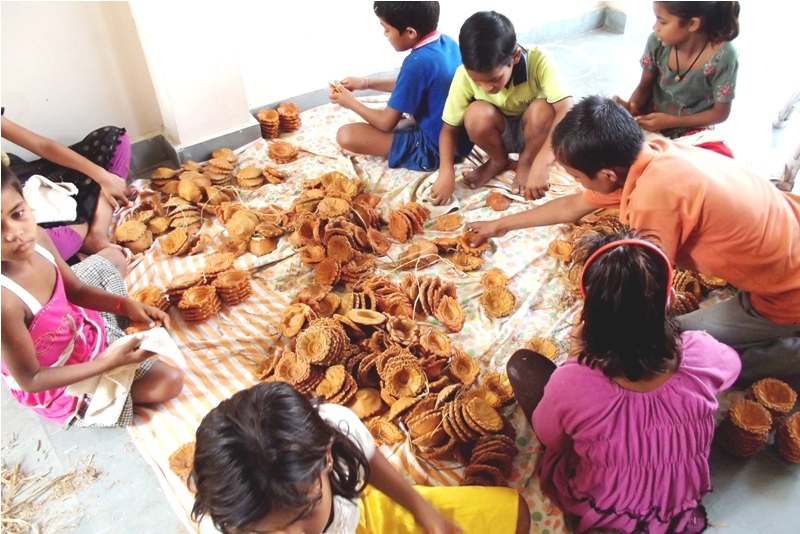 Jyoti Gupta runs a tution centre for slum children at a plot near her house. 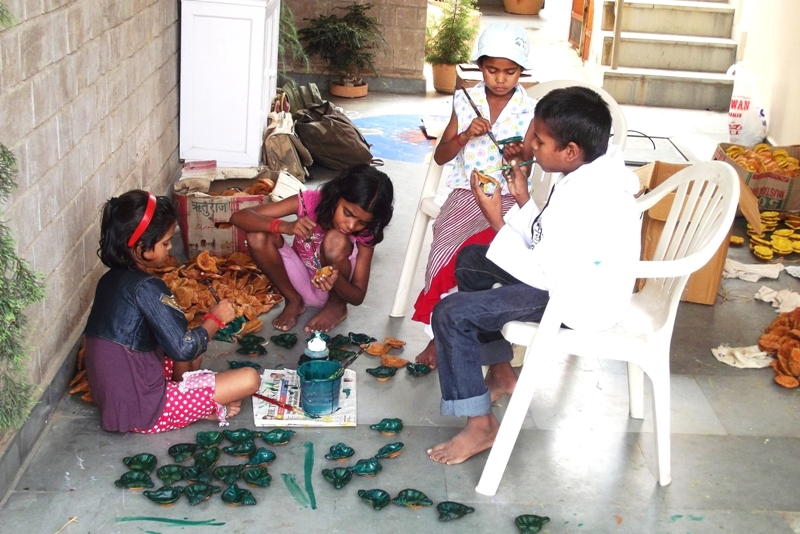 With twinkling eyes and smiling face, these children enjoyed painting diyas. This was empowerment for them. Their happiness melted our hearts and reminded us of Mohanji’s words- Give unconditional love. Diyas went through various stages. We were falling short of diyas!. Ravinder singh went to Amritsar to get beautiful designer pieces. Again Mohanji helped him to locate the seller. He got 1100 diya from Amritsar without any difficulty. 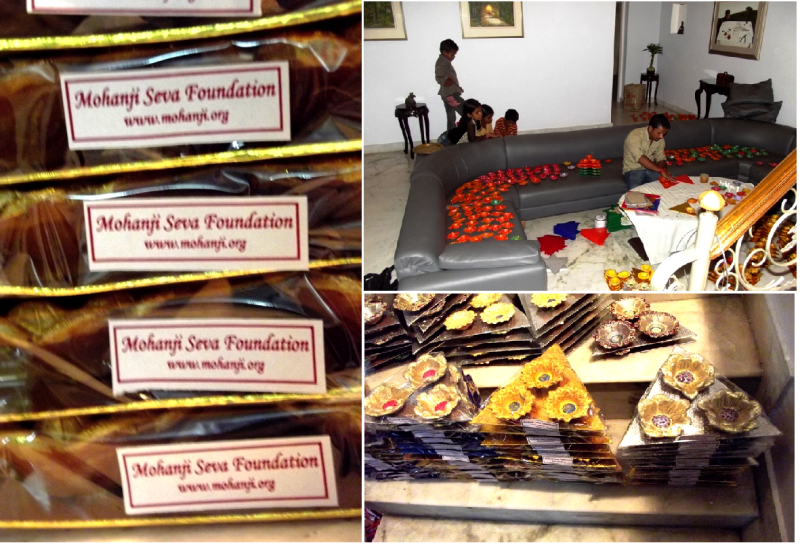 The orders kept pouring in with MOHANJI S grace. The BTW Family worked from 10am to 8pm! We had best of our times. We enjoyed a lot. Our BTW Jammu Family members who contributed in Diya are Kamal Kishore Gupta, Reva Gupta, Suman Gupta, Jyoti Gupta, Narinder Rohmetra, Sumit gupta, Dolly Gupta, Sakshi Gupta, Ajay kher, Ashwani Bhasin, Ravinder Singh, Kanika Gupta, Arihant Gupta, Raghav Gupta, Sapna Sangra, Kamal Sangra, Akshat, Rajesh Gupta, Babreet, Umesh, Avinash, Yogender ji and youngest member is Swasti Gupta and along with us we had new members of the Family which are our dear students from the Jyoti Gupta’s school. Those who were good in painting used to paint. Those good in packing participated in packing. There was no confusion at all. Beautifully, work was sorted out spontaneously. Again we would like to say- this is how MOHANJI works silently! He does not talk, but simply performs. This was experienced throughout our activity. Learning skills ! Empowerment ! Liberation ! 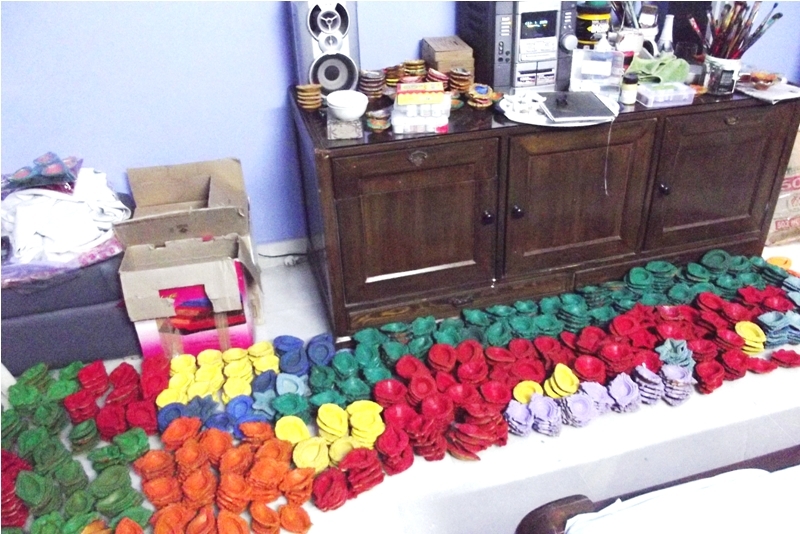 Within 15 days, BTW Family and children painted 5500 diyas. As we were finishing our first order, we got order of 1500 packets form another very famous school named J.K.Public School. Narinder Rohmetra alone managed to sell almost 75% of the packets to the schools , Government Organizations and other private organizations. Unconditional love that bound us together. We did every activity on our own. We had many orders and we were short of supply. Diyas were sold to different schools, Colleges and Corporate houses. Not even a single packet was left. After the completion BTW Family distributed new clothes, sweets to school children and celebrated 2011 Diwali with these lovely children. They were so happy. Mohanji we offer gratitude to you. 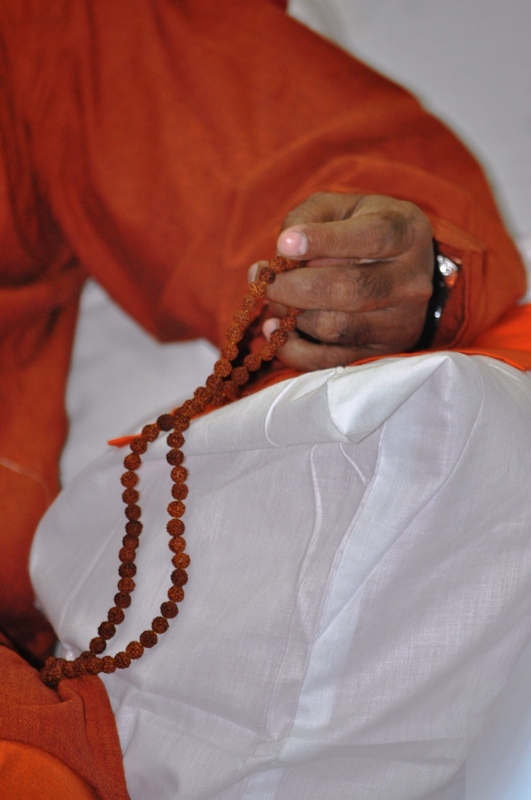 You gave us the foundation of Seva, unconditional love, selflessness and gratitude. We understood you through this Diya painting activity….. BTW Jammu Family loves you a lot. Year 2011 Diwali was our best Diwali. Mohanji gave new dimension and meaning to it through this activity.